Did Italy Just Kill the European Union? Italian Prime Minister Matteo Renzi is now the latest establishment puppet to be kicked to the curb by the wave of populism sweeping the planet. The first victim was U.K. Prime Minister David Cameron following Brexit. Then came the Clinton execution in the U.S. presidential election. And now Renzi gets tarred and feathered, as the Italian people voted overwhelmingly to reject his constitutional overhauls in Sunday’s referendum. Renzi resigned, setting up calls for a new Italian election. That opens up the door for anti-European Union parties like the Five Star Movement to gain power. The euro was down 1.4% against the U.S. dollar in early Asia trading following the vote. It hits its lowest level since March 2015. Against the safe haven Japanese yen, the euro fell as much as 2%. It has since rebounded. Markets are nervous but haven’t totally fallen off a cliff. Short-term investors with no plan are, of course, jittery because Sunday’s referendum was a test of strength of Italian anti-EU forces. And with 59% of the vote, those forces passed with flying colors. Since Italy joined the euro in 1999, gross domestic product has stagnated and government debt has swollen to 133% of annual economic output, the second-highest in the Europe after Greece. Italy has been crippled by debt, high unemployment and a struggling banking sector for at least a decade. And the Italian people have had enough of Brussels-based bureaucrats. Of course, the media is wringing its collective hands over this latest example of dangerous populism (otherwise known as “sovereignty”) to rise up. How dare regular working stiffs awake from the Matrix and reject elite ideals that only benefit the elite! Don’t the proletariat trust the gruel served every morning? Is Italy’s vote the tipping point that sends its banks into a downward spiral? Perhaps… or perhaps not. 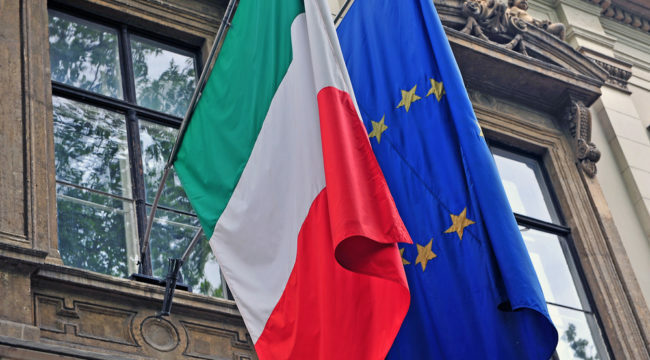 The market’s fear is that a “No” vote would stymie any attempts to restructure the country’s banking system as the cost of financing the rescue through issuing bonds could prove prohibitive for the Italian government. This instability and uncertainty could spread to the rest of the eurozone economy. And does the momentum from this Italian referendum continue to the French elections in early 2017? Brexit then Trump then Italy’s referendum then what exactly? How far does this wave go? Don’t get hung up on not having all of the answers right now. It’s exciting to watch the system take an enema it clearly does not want. The worst-case scenario for the EU is that this vote sets off a chain of events ultimately leading to an Italian banking collapse, a subsequent Italian exit from the eurozone, and an “about time” collapse of the entire EU. Analysts yack on that this is highly unlikely. But Brexit and President-elect Trump were supposedly black swans. Hold on. If political black swans are happening all the time, they are not black swans! The only thing we do know at this moment is that the Italian referendum could open up a bigger can of worms in Europe than anyone expects… or that the EU can handle. The bottom line is the New World Order is rightfully being turned upside down right before our eyes. “Expect the unexpected” is the mantra you better have if you need to stay solvent and possibly get rich. Trend following is prepared for both goals. Please send me your comments to coveluncensored@agorafinancial.com. I’d love to hear your thoughts. Please tell me exactly what you think of today’s issue.